Now, although the success of this film is what actually catapulted the animation department from the brink of death when it comes to the Walt Disney Company releasing animated films... when it comes to the Second Golden Age it wasn't the first. It was actually the second. What was the first, then? That which came before it, of course... I mean, creatively speaking the film that showed the potential that Disney can do came with the 1986 film "The Little Mermaid". I'm talking about that long forgotten classic: "The Great Mouse Detective". The box office numbers are nowhere near as high as Ariel's film or any other that came after it... but you could see the concern for story... the quality of animation... the great characters and even the music. Directed by Ron Clements, John Musker, Burny Mattinson and Dave Michener, this adaption of "Basil of Baker Street" by Eve Titus about a mouse version of Sherlock Holmes was a wonderful tale with engaging characters and a compelling story that is magical from beginning to end. Although the music may not be as memorable as Alan Menken and Howard Ashman, but Henry Mancini does a great job of creating memorable songs. Barrie Inghamas as the Basil of Baker Street was perfect casting and Val Bettin as Basil's trusty assistant Dr. David Q. Dawson was equally good. Those of you familiar with "Duck Tales" will recognize Alan Young playing Hiram Flaversham as the voice of Uncle Scrooge. Also Vincent Price as Professor Ratigan was a deliciously nasty villain... and we also got to hear Vincent Price sing for the first time. Little Mermaid was the third. 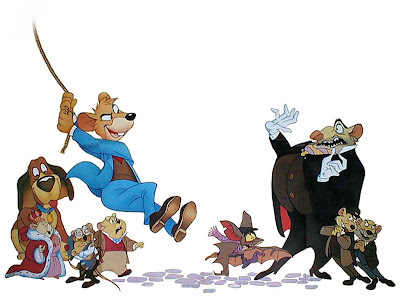 The first was Great Mouse Detective, as mentioned. The second was The Rescuers Down Under, a film that was head and shoulders artistically above where the studio had been for the previous decade. The Little Mermaid came out in 1989, not 1986. The Rescuers Down Under was in 1991. You fail to mention Oliver and Company in 1988. The Great mouse Detective was in 1986 and it was a good film but the real 2nd era begins in 1989 with The Little Mermaid. That film started the great 2nd golden age. That was my point. Most people think that the Second began with Mermaid, but it actually did with GMD... while I liked Oliver, I don't think it holds up as well and the story arch is not as memorable as Detective. The great character development in that movie establishes what was followed through with on TLM when Musker and Clements(also directors on GMD) came aboard.